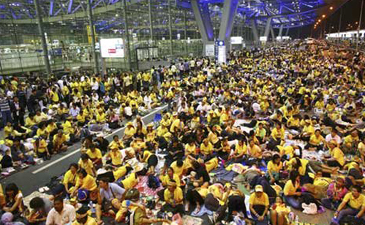 In the wake of two blasts that have descended Bangkok into chaos, at least 3000 passengers including Korean tourists are presumed to remain stranded at Bangkok's international airport as protesters kept control of the building. Operations at Suvarnabhumi Airport have been totally shut down both outbound and inbound after protesters refused to negotiate with anyone except the prime minister. Passengers were unable to leave the terminal because guards from the People's Alliance for Democracy (PAD), the main group behind the anti-government demonstrations, had sealed off entrance roads to the airport. The Ministry of Tourism and Sports in cooperation with the Tourism Authority of Thailand (TAT), Tourism Council of Thailand (TCT), Association of Thai Travel Agents (ATTA) and Thai Hotels Association (THA) transferred the remaining stranded passengers to the following hotels-Regent Suvarnabhumi Hotel, Twin Towers Hotel, IBIS Hotel, Eastin Hotel and Ambassador Hotel Bangkok. Besides the above, the Rose Garden Riverside Hotel has announced welcoming the stranded passengers stay with the hotel during 26-27 November 2008. Also, the Hotel Sofitel Centara Grand Bangkok at Phaholyothin Road has been welcoming their guests, who just checked out from the hotel and cannot fly to their home country due to the temporary closure of Suvarnabhumi International Airport, back to the hotel without charges. On the basis of assistance, for tourists and travelers who cannot travel to their destination as of 25 November, 2008, till the airport reopens, TAT and Ministry of Tourism and Sports have provided accommodation and meals, as well as facilitated tourists as much as possible until they are able to return to their destination. On the other hand, for any tourist whose visa has expired since 26 November, 2008, till the airport reopens, there will be no penalty or charge for overstay from the Immigration Bureau. However, tourists must show their original tickets to avoid being charged.